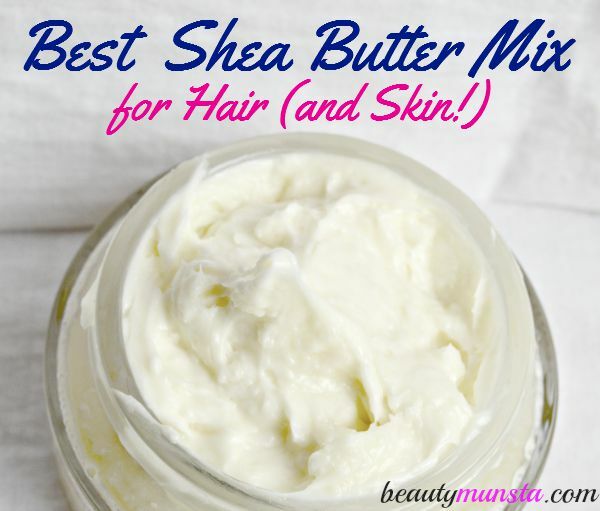 Whipped Shea Butter Recipe for Natural Hair - beautymunsta - free natural beauty hacks and more! 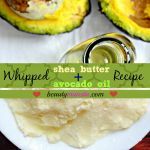 Here’s another variation of whipped shea butter recipe for natural hair, which you can also use to moisturize skin! I’ve used safflower oil, which has a light consistency and won’t grease up and weigh your hair down. Coconut oil is extremely good for taming down frizzy natural hair and dense dehydrated hair. It’s also the best hair oil for hair growth! 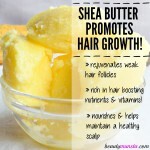 So slather some of this shea butter goodness on your scalp for longer, thicker and luscious hair growth! Aloe vera gel is good for oily haired people like me but it’s also a good sealant so even if your natural hair is dry, you can still apply this shea butter mix after wetting your mane/curls. 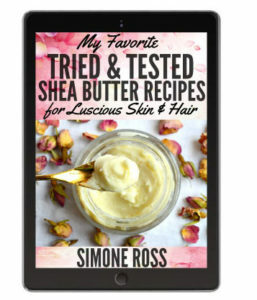 Click on the links below to read more about the wonderful properties & benefits of shea butter for hair and discover some new juicy mixes & recipes! ➝ Coconut Oil – In Ayurveda, coconut oil is the best recommended oil for hair growth. It’s is rich in lauric acid, capric acid, caprylic acid and more fatty acids that nourish the hair, making it soft, smooth and shiny. The fatty acids in coconut oil are medium chain triglycerides so they can easily penetrate and readily be absorbed into the skin. The fat also creates a protective lipid layer over the hair, which protects the hair from germs, impurities & pollutants. Coconut oil is also rich in the skin & hair healing vitamin E and contains an SPF of about 4. ➝ Safflower Oil – Safflower oil has a light consistency which is easily absorbed into the hair and scalp and that’s why it’s one of the best oils to mix with shea butter in addition to grapeseed, apricot kernel and sunflower oils. This pale yellow oil is rich in protein, vitamins, minerals and powerful antioxidants. It’s also high is linoleic acid which deeply moisturizes and hydrates dry hair as well as hair of all types. ➝ Aloe Vera Gel – Please make sure to buy pure aloe vera gel for all your homemade recipes. Aloe vera gel is extracted from the succulent leaves of the aloe plant. It’s rich in nourishing nutrients and is best known for its skin cooling and soothing properties. Aloe vera gel can instantly cure sunburns, inflamed scalp, scalp eczema, itchy scalp, scalp inflammation, redness and other skin inflammatory conditions. It’s also a natural astringent which tones and tightens, thereby helping shrink large pores on the scalp and reducing oily hair. ➝ Geranium Essential Oil – Geranium essential oil is extracted from steam distillation of geranium flowers, which are native to Africa. It has a flowery feminine scent and is one of my best essential oils for skin and hair. 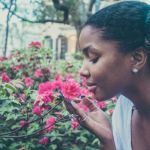 It’s got lots of beauty benefits too: it fights scalp acne, cures dandruff soothes rashes, gets rid of oiliness, gives your hair a beautiful scent, and so much more. Read more beauty benefits of geranium essential oil for skin & hair here. ➝ Lavender Essential Oil – One of the most popular and widely used essential oil, you can find lavender essential oil in almost every household nowadays. It’s mainly known for its soothing properties that can promote a good night’s sleep but it also has a whole lot of beauty benefits including cleansing the skin & hair, healing acne, preventing premature aging, soothing skin inflammation and redness and so much more. Wanna know the benefits of lavender essential oil for hair? Go here. ➝ Tea Tree Essential Oil – Tea tree essential oil is a powerful antibacterial, antiseptic, anti-fungal and antimicrobial essential oil. Read more beauty benefits of tea tree essential oil here. 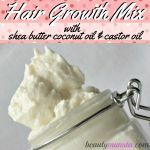 One of my best shea butter mixes that can be used for natural hair – it contains coconut oil, safflower oil, aloe vera and geranium, lavender and tea tree essential oil! You can use it to moisturize the skin too! 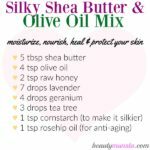 Melt down or soften (it’s your choice) the shea butter using a double boiler. Add all the ingredients (safflower oil & coconut oil) except the aloe vera gel and start whipping using the hand mixer, first on low speed for 2 minutes: then on high for 5 minutes. The mixture will start turning white in color and get a smooth consistency. Remember to keep scraping down the sides with a plastic spatula in between to get all the mixture whipped. Next, add the aloe vera gel while whipping the mixture and blend on high for 5 minutes for the aloe vera to get fully incorporated. Note: This step is important because if not whipped well, your shea butter mix will still contain aloe vera gel bits and pieces.